Tree trekking and the topsy turvy turtle... - Who's the Mummy? It’s a busy few weeks for me at the moment. Back to school, new website, BlogCamp, MAD Blog Awards… there’s a lot going on. So this weekend we headed up to the Lakes for some fresh air. A day out at Windermere – perfect! Brockhole at Windermere is only an hour from where we live, and has a great adventure playground, as well as loads of space for Flea to run around, and lovely picnic areas. We took Flea’s Dad with us. I get along okay with my ex most of the time, but lately he’s been driving me NUTS by referring to me as “Sheldon“. For the uninitiated, Sheldon is a character from the TV show “The Big Bang” who is a neurotic genius, crippled with OCD and utterly unable to relate to other humans. “One lab accident away from being a super-villain” is how he’s described. 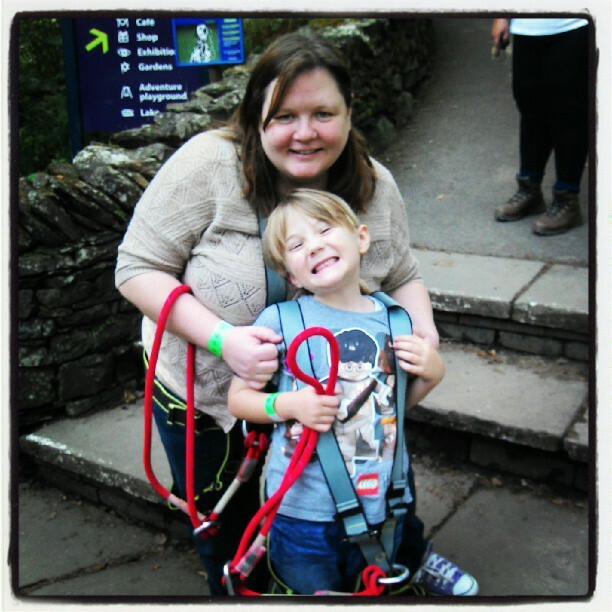 Anyway we arrived at Brockhole to find there’s a new tree-top adventure course called Treetop Trek. Flea’s been desperate to try out one of these for years, and begged her Dad to take her on the course. He’s afraid of heights, but agreed. Flea asked me to join in, and I couldn’t think of a decent excuse. So it was that half an hour later I found myself trussed like a turkey and clambering over a series of wobbly rope bridges and negotiating various obstacles to get from tree to tree around the course. The ex went first and I went last – the idea being that if Flea got stuck, there would be someone in front and behind to help out. It seemed like a fine plan but it turned out Flea was like a tree-dwelling monkey, leaping from log to platform to rope. The ex? Not so much. He was absolutely white, and trembling across the first few obstacles. There might have been the odd shriek and whimper. Flea thought this was hilarious. I felt like I should be the bigger person so I told Flea that her Dad was actually being really brave, because he was doing something he was really frightened of. And it’s really not fair to laugh at someone who’s doing their best, and being brave. See? That’s some top parenting right there, friends. I was just helping Flea jump across a gap between trees when I heard a scream. Flea’s Dad had wandered ahead and tried an obstacle on his own. It involved sitting down in a low chair, and using a guide rope to pull the chair across a 15 foot gap between two trees. The ex had sat in the chair and somehow – at the halfway mark – just fallen off it. He was dangling at the end of his safety rope, like an upside down turtle, 25 feet off the ground. Flea and I rushed to the platform behind him. There was no way to get past him so all we could do was encourage him to use his arms to pull himself back towards us, so we could pull him up. The ex tried manfully to pull himself backwards, and I reached for his hand but he’s considerably bigger than me, and with nothing to hang on to on top of our platform, I couldn’t heave him back up. Next, we encouraged him to pull himself the other way, and try to climb up on to the platform in front of him. He tried, but couldn’t quite manage it. He’s a big fella, and considerably older than me. So he stayed where he was, just dangling. I was trying to be REALLY supportive, honest I was. I was telling the ex to stay calm, that I’d get a member of staff to help, that he couldn’t fall, he was going to be fine. Then a thought occurred to Flea. Well, that was me. I totally lost it. I’m ashamed to say I laughed so hard I almost fell off the platform. And the more I felt bad about laughing, the worse it got. It’s like that time my university room-mate’s cousin was eaten by a shark. You know it’s not funny. It’s really not. But you just can’t stop laughing. Awful. Just awful. It took about 10 minutes but the Ex was finally rescued. There was a winch. Then the staff let us over-take him, and he was escorted around the rest of the course by a strapping young man called John. He finished the course about an hour after the rest of us. I pretty much know I’m going to Heaven because I didn’t take a photo of all of this for posterity. I am officially the world’s greatest ex-wife. But trust me, the mental image will sustain me through many a long, quiet evening for years to come. And if that’s not enough, Flea called her Dad “Sheldon” for the remainder of the day. Previous Post Stalking. No, not that kind. Next Post Mum of the Year. Or, you know, maybe not. And very restrained of you; I’d have had photos uploaded to Facebook and Twitter in a heartbeat. I know. I just kept thinking this is the world’s biggest ever deposit in the karma bank, though. Brilliant! I actually did laugh out loud. Not at poor Sheldon there dangling like a Christmas bauble, but at the shark story. Amazing. I think I would have laughed too. Oops. Troubles Mum recently posted..Do I really want to be a ‘soccer mom’? Advice needed. The shark story was amazing. In a bad, bad way, obviously. michelle twin mum recently posted..#SilentSunday – JJ making me smile! Hilarious. Thanks for sharing. I definitely think that’s karma. My father in law once got locked out of his house by us; he’s a portly chap but amazingly climebed in through the tiny square window in the downstairs window, where he got stuck for some considerable time, dangling directly above the toilet. I have no idea how he got out but he told the story at dinner that night. I had only known him a few weeks but I got the giggles so badly at the dinner table that I eventually had to excuse myself because I kept snorting and he was offended. I sometimes wish I didn’t totally adore him; if he was mean to me, I could tell it to everyone to get my own back. Haha! Oh, I really sympathise with your Ex, as this would have been me, but you have got to laugh at these moments in life, haven’t you? Everyone tells me that when I first saw Danny on the roadside after he was hit by a van and unconscious, I was laughing hysterically for ages. I honestly cannot remember as I was in such shock. Oh thank you for the laugh. Apparently every family has a Sheldon… yes we have someone that knocks on a door… again… again…. again… and all sorts of very Sheldonish behaviour… But as for being the best ex-wife, I am so impressed there is no way on earth that I would have missed that photo opportunity. It’s all about making memories I guess!!! Oh dear–that did conjure an image! And like you, there is no way I could have kept a straight face. Actually, I’m a frequent Inappropriate Laugher. thanks for a great post! I know. Fair play on the ex for saying I could blog about it “providing you also mention my age and lack of fitness”. Love it! And now it’s just a matter of choices for the next Halloween: Batman?? Teenage Mutant Ninja Turtle? or…. Sheldon? Oh my god, that is brilliant! How you didn’t YouTube the whole thing, I don’t know. I LOVE LOVE this story! Although, am slightly concerned that we may be heading for a divorce as I am always laughing at my husbands misfortunes and he mine!! Super Amazing Mum recently posted..Damien Hurst, Red Ted Art, Tracey Emin and ME! Oh, it IS funny. It IS, it IS. Lisa recently posted..Taking it for the team. Thanks for the laugh. I know what you mean about inappropriate laughter. Sometimes I have laughed at my kids when they fall down and its really not funny but it looks so hysterical. I know what you mean about the shark thing too, OH told me about his grandfather who had his leg bitten off by a tiger, I laughed too, probably not a good thing. After I stopped laughing on the floor rolling round (my fingers aren’t long enough to type from down there) I had myself think ‘if there was a God this would have happened to my ex’ – but that would be mean, wouldn’t it? Errr no! I am very disappointed there are no photos. This is not a ‘best parenting post’ but purely and utterly for the benefit of all of us with prats for ex’ s (not counting the downright calculated nasty ones – I’d if cut the rope for them!). Seriously, thanks for making my night. You did, in fact prove you are the better person (I didn’t doubt it for a minute), but in light of how most divorced parents have their ups and downs – I’m sure you deserved the side-splitting joy this gave you. Kudos to flea for the ‘Sheldon’ reference! Honestly, we get along about as well as divorced people ought to, but there isn’t much in life better than seeing your ex-husband dangling from a tree. Ah, happy memories. Hee hee!! I actually watched that episode of The Big Bang Theory a couple of nights ago. And how on earth did you resist even a sneaky photo on your phone? You are indeed a wonderful ex-wife! A great story! We are huge fans of The Big Bang Theory and I remember the episode with Sheldon hanging on the climbing wall very well. Genius! Hey Buddy!, I found this information for you: "Tree trekking and the topsy turvy turtle…". Here is the website link: https://www.whosthemummy.co.uk/how-to-have-a-perfect-day-out/. Thank you.